New Delhi: Soon airline-like food would be on the plates of train passengers as the Railways has decided to initiate major reforms in its catering services under which it would "rationalise the menu" and use Artificial Intelligence (AI) and CCTV cameras to flag irregularities in preparation. Railway Board Chairman Ashwani Lohani today said the "high-in-quality- and-taste" food would be served from July -- first on premium trains such as Rajdhani, Shatabdi and Duronto on experimental basis and then on all other trains. "The menu would be simple, could be in the form of combo meal, comprising at best two to three items similar to what is served by airlines. High in quality and taste," Ashwani Lohani told mediapersons. The existing menu, he added, comprises six-seven items, but is often low on quality and also at times compromised on hygiene. The public transporter has come under repeated criticisms over the quality of food served. Last year, the Comptroller and Auditor General (CAG), in its report had termed the food served at stations and in trains "unfit for human consumption". Under the new initiative, the Indian Railway Catering and Tourism Corporation Ltd (IRCTC), which manages catering onboard trains, would engage managers and supervisors in all trains for random checking, alongside in premium trains, Lohani said. The IRCTC would be directly in charge of the 68 new modern-base kitchens coming up across the country. All the kitchens would be ready by December 2019, fitted with CCTV cameras for centralised monitoring, the officer said. An Artificial Intelligence (AI) module is being installed at these base kitchens, he said to find anomalies through CCTV footage and raise issues for initiating actions. These facilities would be provided with high-end kitchen wares with provision for separate cooking of vegetarian and non-vegetarian food, Lohani said. The base kitchen at New Delhi station alone would be equipped to prepare 20,000 to 25,0000 meals a day, he said. The pantry coaches would also be regularly maintained and cleaned and new design coaches would be introduced with separate space for storage and washing, he said. 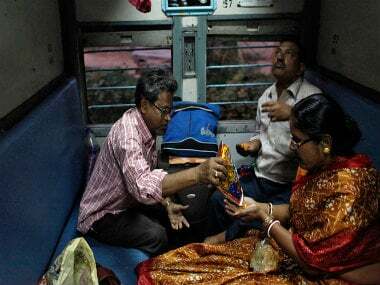 A mini-pantry car would be introduced in Garib Rath class of trains and then in other trains from where food would be distributed to the entire train, the Railway Board chairman said. This will do away with the prevailing practice of stacking up the food close to the lavatory before being distributed, Lohani said. Stainless steel trolleys would also be used to serve food in the premium trains, he said. IRCTC Chairman-and-Managing Director MP Mall said each of these base kitchens would cost over Rs 1 crore to set up and they would come up in cities such as Howrah, Kanpur, Raipur, Bilaspur among other places. Lohani said these measures are being taken as the Railways is committed to "stabilising" the catering system, which kept shuffling between the Railway Board and the IRCTC. It came back under the aegis of IRCTC from 2017. Responding to recent complaints from passengers about the quality of food served and about drinking water being allegedly collected from toilets, he said, "These cases dont reflect the ground reality".